I am the type of girl who always buys the same brand of bread. Always. I think it must be because I just continued buying what my mom always bought. In any case, I always buy Dempster's Whole Wheat. 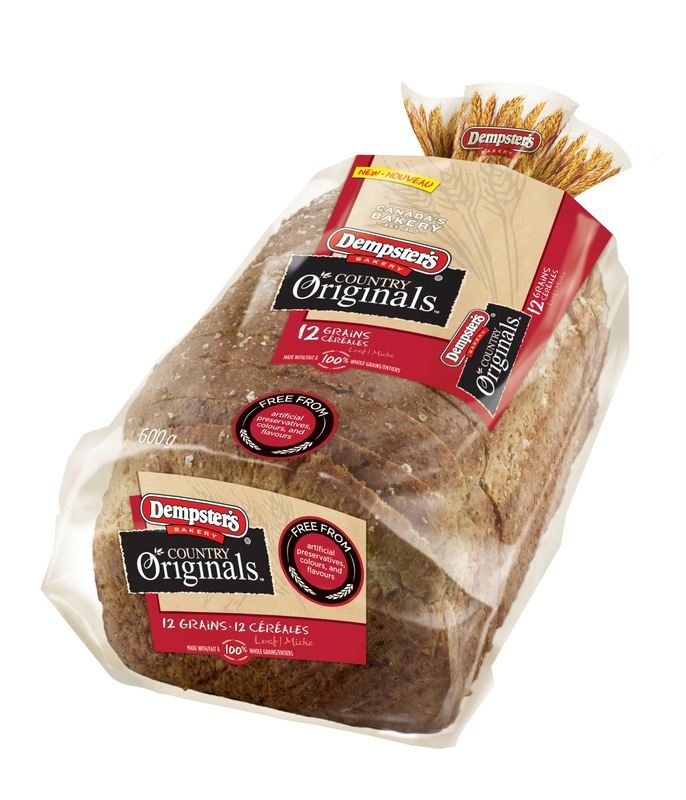 Hubby always wants me to get the bread with all the delicious grains in them, but for some reason I just always want the comfort of my Dempster's Whole Wheat. 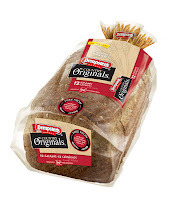 When I received an email telling me about the new line of Dempster's breads, I was intrigued. After all, it's my go-to brand. I received a coupon for a free loaf, and went to the local grocery store to try it out. The new line is called Dempster's Country Originals, and it's free from artificial preservatives, colours and flavours. They also have no high-fructose corn syrup and are made with 100% Canadian wheat. Sounds awesome, right? I have to admit that a little part of me was wondering if it would taste bland (that artificial stuff is in there for a reason, right?! ), But you know what? It was the same delicious taste I was used to. I even went out on a limb and bought the 12 grain, much to Hubby's delight. This will be my new standard purchase for bread. It was delicious, and I love that it's a healthier choice. I guess because it is starting to look a lot like fall lately, I have been thinking and dreaming a lot of French Onion Soup. However, our weather has been hot and nice still (which is strange for Calgary, honestly), so I don't feel like I can make it for dinner. It would be like cheating on Summer with Fall. So instead I decided to try something I have never done before, which is create something to eat completely from my own head. I almost always use some sort of recipe when I cook, even if it's just as a base. 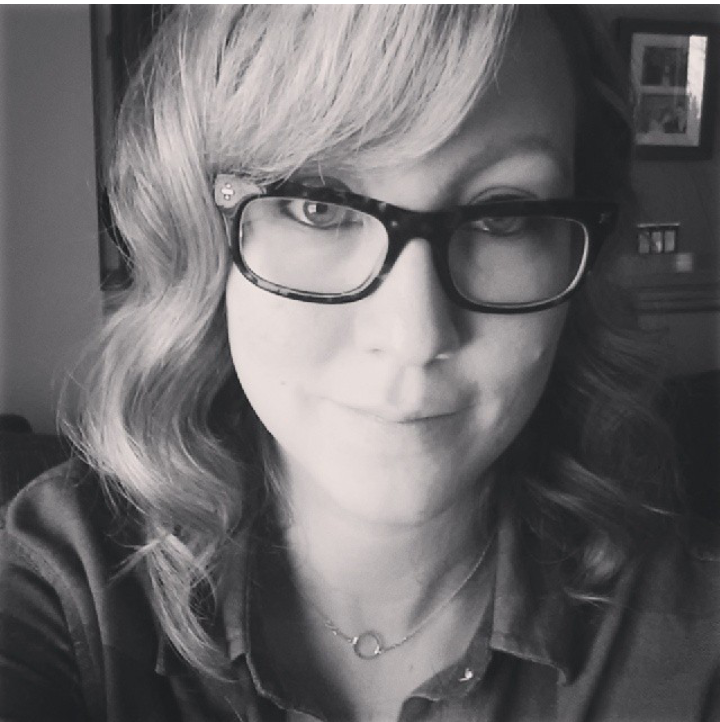 I thought about what I love most about French Onion Soup, which is basically the cheese and the crouton. So, behold! 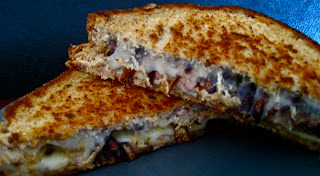 It is my very own recipe for a French Onion Soup Grilled Cheese Sandwich. We had a left over beef roast in the fridge, so Hubby's half of the sandwich had beef, while mine did not. I prefer to let the cheese be the star. Mmm...melty cheese. Enjoy! Melt 1 Tbsp of butter over med-low heat. 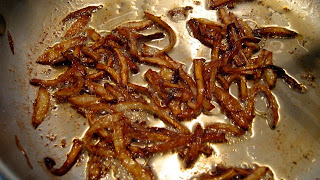 Add the onions and cook for about 10 minutes, stirring occasionally until soft and brown and delicious. Add worchestershire and wine and cook for a few more minutes until most of the liquid is absorbed. In another pan, melt the remaining 1 Tbsp of butter over med heat and place a slice of the bread in the pan. Top with 2 slices of Swiss cheese, the onions, the roast beef (if desired), 2 more slices of cheese and the last slice of bread. Cook for a few minutes until golden, and then flip. Once the bread is golden and the cheese is ooey-gooey and melty, you are ready to enjoy! How to Find the Time? !